We are Claudia Schurr (1967, sociologist, German) and Yves Chavan (1967, architect, Swiss). We have lived in Oaxaca, Mexico since 1998. Yves went to Mexico for the first time in 1986 to visit some friends he had met while studying English in London. One of his Mexican friends had become an architect and invited him to come back and work. So, together, we decided to go to Mexico in 1997. Although there was more than enough architectural work in Mexico City we were drawn instead to the rural areas of Mexico. We ended up in Oaxaca which is rich with indigenous influences. It was in Oaxaca that we founded Tierraventura in 1999. We were enchanted by Mexico and fell in love with the country. It has become our home. Over the years we worked on an idea to take people to places they wouldn’t see in the course of an ordinary vacation – places we consider to be the “real” Mexico. These places take you beyond ordinary sight seeing and help you to see the sometimes hidden aspects of the culture. Over the years we’ve made a lot of personal contacts in Oaxaca, Chiapas and the Yucatan; contacts which really helps make our way of touring possible. Anyone wanting to get off the beaten path would do well to join us on one of these trips. Our work has also become our hobby and we travel a lot to discover new places and projects in Mexico. Yves occasionally uses his architectural skills to help developing ecotourism projects. My biggest interest is traditional medicine. We work with shamans and healers in many different locations and organize workshops on this fascinating subject. Our motto is: there are no problems, only solutions. I took a trip to Pakistan in 1990 which I will never forget. I traveled with my mother and a Pakistani guide, Karim. Karim helped us to see and understand his country in a very intense and personal way. Thanks to him I had experiences and revelations which still affect me deeply. The inspiration to start Tierraventura came from this trip. It is exactly what I want to offer our clients: to get to know Mexico in an intense and personal way with a small group of friends. Tierraventura intends to bring our clients to this kind of experience. tierraventura is a small company based in Oaxaca, southern Mexico. It is our intention to show the “real” Oaxaca to our clients: the villages, the celebrations, the traditions, the mountains, the coast, the history and all those elements which tourists are not usually able to experience. The state of Oaxaca is deeply rooted in its indigenous traditions, famous archeological sites such as Monte Alban and Mitla, a strong colonial inheritance and a variety of astonishing mountain and coastal landscapes. And yet there are many places that tourists rarely visit. We specialize in offering trips in the mountains, the Pacific Coast, the Sierra Mixteca, and the northern and the southern Sierras. Our groups have a maximum number of six people and our program offers one and two day trips, as well as tours lasting up to two or three weeks. 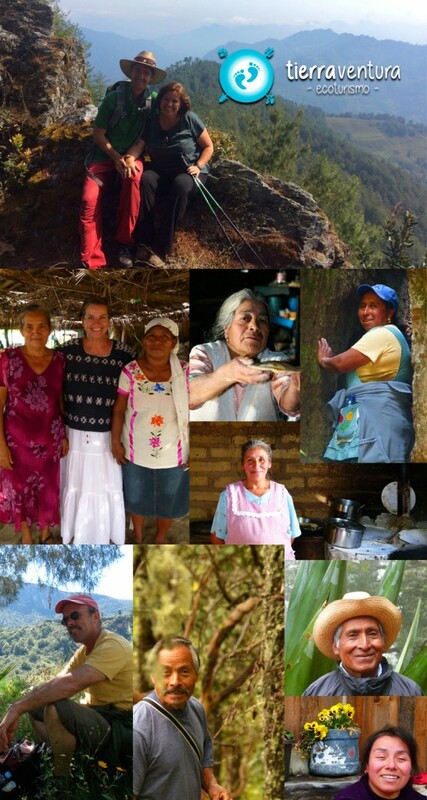 We hope to show our customers as many aspects of life in Mexico as possible and to connect culture with nature. Oaxaca is home to sixteen ethnic groups and a wide variety of vegetation. This diversity offers the possibility to discover many different aspects of Mexico in just one trip: we offer hiking tours from village to village, horseback riding and traditional indigenous medicine. By sleeping and eating in local villages, our tours support small tourism infrastructures (guesthouses, restaurants and ecological projects). We are accompanied by a native guide whenever possible on our hikes. It is our aim to provide a ‘soft’ tourism by helping the communities to secure a sustainable income. This is the only reliable way to save and protect the landscapes, the traditions, the historical buildings and the many different histories throughout the state of Oaxaca. Grounded in this philosophy, we strive to assist local communities while offering our customers alternative means to discover Mexico, away from well-known places with commercial tourism infrastructures. For us, ecoturismo is a combination of the many aspects which contribute to the discovery, enjoyment and appreciation of a country. Always respecting the existing cultures and the environment, we try to bring our clients and these cultures together, providing you with the opportunity to discover the day-to-day lives and working conditions of the Oaxacan people. Our top priority as a company is to expose our clients to the beauty of the local environment while supporting ecological and community projects in a responsible and sustainable way. Oaxaca has tremendous potential for ecotourism, first of all because of the different and unique landscapes and, secondly, because of its rich and diverse indigenous cultures. Our interpretation of ecotourism guarantees client satisfaction and enthusiasm on the one hand and on the other it gives us the possibility to contribute to sustainable community projects in various regions of Oaxaca.